So you've read the articles, books and blogs, and you've watched all the videos of the Grand Masters and Distinguished Masters — you can do this, right? This is where most people breathe a sigh of relief and go back to their repetitive practice routine (if they practice at all). And then they fail miserably because at the end of the day becoming a better shooter is not about knowing, it is about doing. In the first article in this series, I discussed the concepts associated with deliberate practice. In the second, I discussed practice physiology and how our brains and bodies develop as a result of practice. I also discussed how to examine each task associated with an activity and break it up into discrete steps for deliberate practice. In this article, we'll be putting it all together and look at how we can improve our shooting through specific exercises and drills using deliberate practice methods. Each of these major tasks is composed of subtasks that also must be performed correctly. We can break each major task down into subtasks, then apply the deliberate practice methodology to improve our skills. For example, as we analyze the major task of turning then drawing the pistol, should we turn toward the side where our pistol is holstered (in my case, the right side) or the side opposite our pistol. Some experimentation shows that the distance to the target is shorter, and our ability to get the pistol on target is faster if we turn toward the side with the holstered pistol. Another example is moving from one shooting position to another. Do we dismount (lower) the pistol as we move or keep it mounted (in the firing position)? If you are only moving a few feet, then keeping the pistol in a firing position is fine. If you must move more than a few feet, then dismount the pistol (muzzle awareness at all times) and run normally to the next position. As you cover the last few yards, mount the pistol so that as you to stop at the firing position you have the pistol ready to fire as you acquire the target. This saves you the additional time you would spend if you had waited until you came to a complete stop to bring the pistol onto the target. Drills can help us deliberately practice and master the subtasks associated with each major task. However, a key point: You should push yourself with a par time goal that is challenging but not impossible for zero down with each sequence. Ideally, you only want to be succeeding in 50-80 percent of your attempts. Less than that, and you'll get frustrated. More than that, and you're not pushing yourself hard enough — and that's how you get better. When you can meet the par time consistently, speed up. This criteria applies for every deliberate practice session and every drill. Let's look at a few drills that can help you work on your weak points. 1. The 1,2,3 Drill: This is one of the simplest drills. Starting at a distance that is challenging for you, draw and fire one shot at an IDPA, USPSA, 8-inch paper plate, etc. Reholster and then draw and fire two shots; reholster, draw and fire three shots. Five yards is a good starting distance for a novice, seven for a more experienced shooter, and 10 yards and greater for a better shooter. Concentrate on the fundamentals of a perfect grip, stance, sight alignment, sight picture, trigger press, etc. 2. 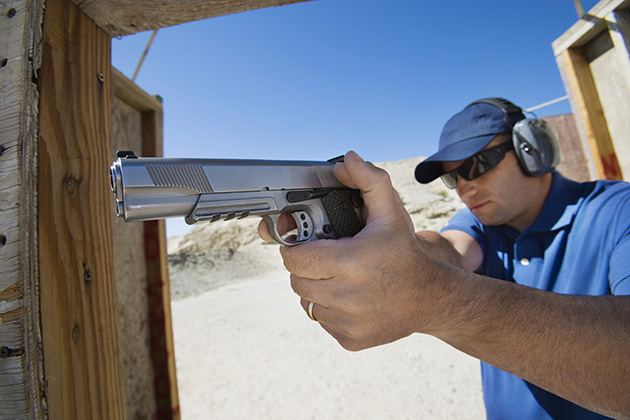 The 1-Reload-2 Drill: Once again, start at a distance that is challenging for you, with your finger on the trigger and pistol aimed at the target. On the start signal, fire a single round at the target, perform a reload, and fire two more rounds at the target. This reloading drill forces you to re-establish a proper grip and sight alignment/picture after the reload in order to control the pistol and get accurate and fast hits. Practice every style of reload — e.g., slide lock reload, speed (aka in-battery) reload and retention reload. Start at a distance that exceeds your point-shooting ability to ensure you are actually doing the post-reload actions correctly and not just point shooting. 3. The Quick and Precise Drill. Place four targets in a line with a two-yard separation between targets. Start with your pistol holstered and concealed, if you wish. Draw and fire two body shots at T1, a head shot at T2, two body shots at T3 and a head shot at T4. Reload (if necessary) and reholster your pistol. Then, reverse the sequence and fire two body shots at T4, a head shot at T3, two body shots at T2 and a head shot at T1. Reload and reholster your pistol. Finally, draw and fire one head shot at T1-T4 in any order. When you finish, you will have two body and two head shots on each target. 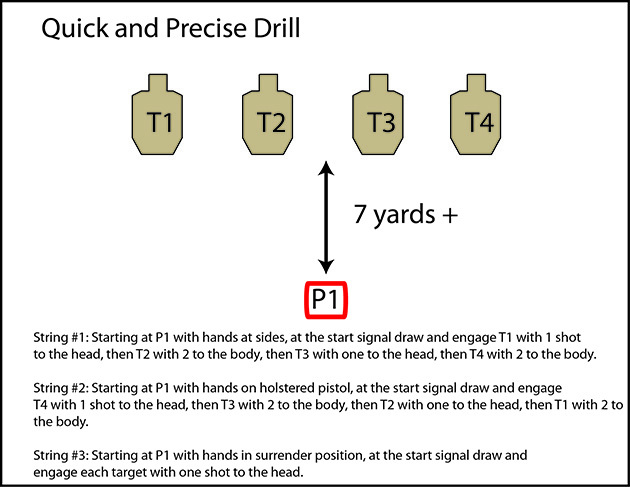 The Quick and Precise Drill permits you to practice most of the major tasks in the IDPA classifier Stage 1 including the draw, transition between targets and executing precise shots. 4. The 1-Move-1 Drill: Place a single target at a distance that is challenging for you, some distance from a barricade or similar prop and fault lines in place on the left and right sides. Start in the open 10-15 steps from the left or right side of the barricade. On the start signal, fire a single round at the target, dismount the pistol and move to the barricade. As you approach the barricade, remount the pistol. When you acquire the target, fire one shot to the target. Repeat from both sides of the barricade. For variations of this drill, you can use barrels and other props and go from standing to kneeling, etc. The 1-Move-1 Drill helps you practice moving from one shooting position to another. It helps you plan your entry, determine where your feet need to be when you stop, identify visual clues for where your pistol should be as you come to a stop in relation to the target, and plan your exit. String 1: Draw and fire five shots freestyle. String 2: Draw and fire five shots using primary hand only. String 3: Start with only five rounds in your pistol. 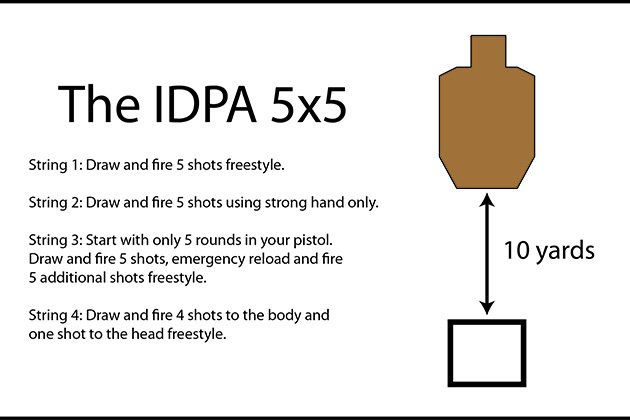 Draw and fire five shots, emergency reload (slide lock) and fire five additional shots freestyle. String 4: Draw and fire five shots to the body and one shot to the head freestyle. I initially dismissed the 5x5 as too easy — that was until I actually went out and shot it. Although I have fired Master using the 5x5 in all divisions except revolver, this was not a trivial endeavor. The 5x5 is ideal for ranges with limited space. If your range does not permit drawing from a holster, the start from low ready. These are just some drills you can perform. There are literally hundreds of different drills available through a cursory search of the internet. One point to keep in mind: If the drill does not push you out of your comfort zone, then it is not helping you to get better. Mindlessly going through the motions does not improve performance. What else can you do? Attend matches and observe the best shooters. What are they doing that is different than what you are doing? If they are willing to discuss after they have shot the stage, ask this person to help you identify what you might need to change in order to be able to do what they doing. Ask them to watch you shoot and critique your performance. You are more likely to receive feedback of this nature at local and perhaps regional matches where the stakes are not that high. Developing master-level shooting ability requires good old-fashioned hard work. Employing the deliberate practice methodologies, understanding the physiology of practice and how your body develops skill at a particular task, and then performing shooting drills that develop and test these skills will lift you to the next skill level.